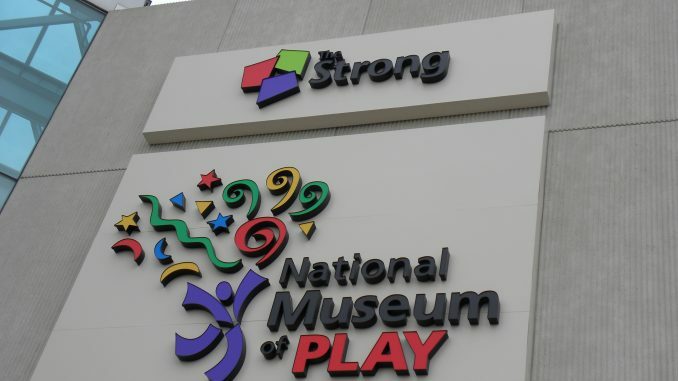 While visiting Rochester, New York last week, it was suggested to me that I visit the Strong National Museum of Play. Under the impression that it was a science museum similar to the two within driving distance of where I live, I was excited to go, but my expectations were limited. What I ended up experiencing was so far beyond what I expected that I decided I needed to share it with all of you. First of all, the Strong Museum of Play is NOT a science museum. While I do love a good science center, this nerd mecca focuses on games, toys, books and superheroes. An amazing location for both children and adults, this museum spoke to a great many of my loves. That’s right! There was a full recreation of Sesame Street with places for kids (and this adult) to climb, explore and interact. You could even visit an incredibly large recreation of a local grocery store chain (Wegman’s). Full of aisles of produce, frozen food, canned goods and even a sushi bar, kids could shop and check out with a cart full of artificial groceries. Next to Sesame Street I was transported even further back into my childhood as I got to visit Berenstain Bears country. Geared more for the younger children, I still enjoyed walking around and seeing the places and characters from a book series that was one of the first to foster my love of reading. At this point of my visit, I’d been having a good time, but I was ready for something more nerd oriented and I was not disappointed. A large comic book superhero, Star Wars and vintage pinball arcade made up the rest of the first floor. Not only did each section have great displays, information and interactive exhibits, there were also arcade game cabinets spread throughout, each matching to the theme of the area. Purchasing a pocket full of tokens (only 5/$1), I played old X-Men, Space Invader and Star Wars video games. Now totally geeked (pun intended) I ventured upstairs to a place I had heard of but had no idea was located in Rochester: The Toy Hall of Fame. Displays and the histories of toys from my childhood and decades before and after lined the walls and I instantly began to wonder which toys I would put there if I were given the chance. From Legos to Barbies to Super Soakers, so many toys had been honored, but some of my favorite exhibits were also the ones I may never have thought to add myself: the stick, blanket and cardboard box. While not jumping first into my head as I reminisce about the toys of my formative years, I can hardly deny that I have spent hours/days playing with each. What would childhood be without a box/blanket fort and a stick sword? Adjacent to the Toy Hall of Fame was the Video Game Hall of Fame. Aisles of vintage arcade classics were there for the playing and if I had had the time/tokens, I would have played them all. As it was, I had to be selective so I killed me some Foot Soldiers in TMNT and lead Bart through the streets of Springfield, whacking things with his skateboard. I could have spent days reading the history of video and board games. So many games I had never heard of alongside many I can still close my eyes and mentally play through. Seeing parents getting to share the beloved games and arcade environment with their kids was a special treat. I especially got a little more geeked than I should have Snapchatting a WoW server board pic to my old guild buddies. Setting nerd me aside, one of the most unique and amazing aspects of this museum appealed to the teacher in me. In every single exhibit, on the walls, tables and display cases; were books. 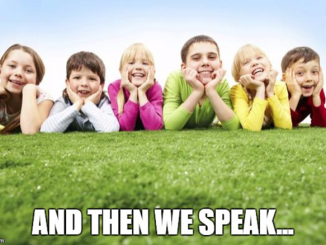 Books for all ages on all topics. You could grab one up to curl up and read with Big Bead or alongside the Hulk. There were reading nooks and chairs everywhere. And, best of all, you could check them out! If you had a Rochester Public Library card, you could take your book selections up to a counter and take them home. It was one of the coolest ways I’ve seen reading presented to children on topics they are into already. Although the copy of Clockwork Orange in the Sci-Fi area did make me question whether anyone there had read it. Not something I’d want my 12 year old to pick up and peruse. What started as a fun trip to another science center turned out to be a day of me running around like a little kid telling my friends “Look at this! Over here!” While my trip to Rochester was full of many fun adventures, The Strong National Museum of Play was one of the coolest places I have ever been. Whether you live in the area or need to take a 5 hour train ride to get there (only $55 one way) I highly recommend anyone who is currently a child or ever was one to check it out!